"Colored cottons hang in air Charming cobras in the square striped djellebas we can wear at home." MARRAKECH, Morocco -- The same exhortations to prayer have been called from this city's minarets five times each day for a millennium before Graham Nash's lilting lyrics etched this rose-walled medina into the imagination of a generation of baby boomers. Except of course that these days, the chants of "Allah hu Akbar" are amplified. Founded in 1070 on the dry, stony plains along the Tansift River at the base of the Atlas Mountains, the fortified city was conceived as the capital of the Kingdom of Marrakech, as the conglomerate of Berber tribes in the Mahgreb, as the northwest shoulder of Africa now called Morocco was then known. Situated on high dry plains at the base of the mountains, Marrakech has become a year-round destination, with clear blue skies most of the year and moderate temperatures, although August and September can get very hot. Derived from Berber "Mur (n) akush" for land of God, the walled oasis was conceived on a royal scale. A governmental center of commerce and craft, the streets of the walled medina were studded with private but palatial mansions and secret gardens, hidden amid the maze of souks and stalls clogging the lattice of narrow lanes lacing around Djemaa el Fna, Africa's busiest open square. 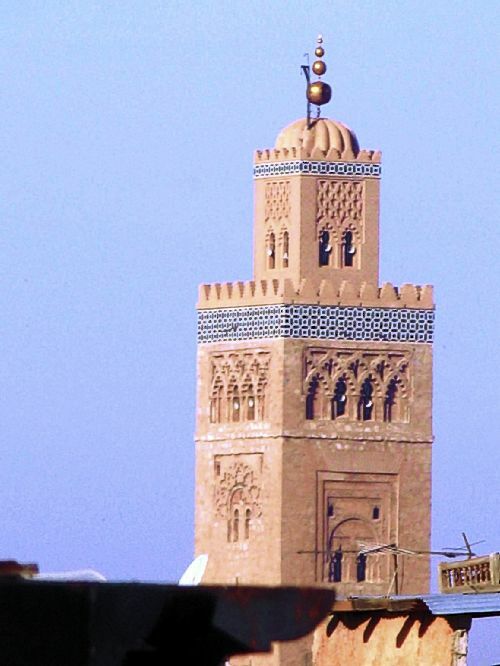 All of it was overseen by the magnificent, 221-foot-high minaret of the Koutoubia Mosque, which was the model for countless others around the Islamic world. 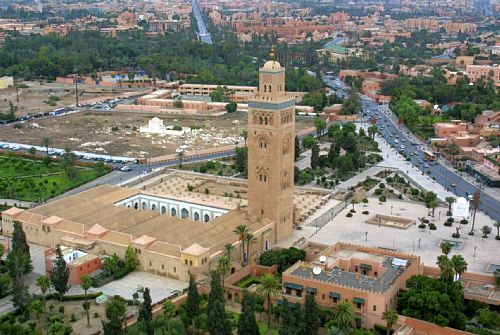 Although the seat of Sultanate power shifted to Fes just two centuries later, Marrakech managed throughout the centuries as the gateway to the Sahara and the city of seven saints, gathering a reputation as a center of Islamic culture and sophistication despite a succession of European encroachments. In the 18th and 19th centuries, the city again became the capital and experienced new prosperity. In 1904, when Morocco fell into France's "sphere of influence" and the national capital was moved to Rabat, a new city, Gueliz, grew outside the medina of Marrakech. Ironically, that development spared the architecture within those walls where daily life continued to proceed much as it always had. To a considerable degree, it still does. By day, the Marrakech medina still throngs with mundane activity, starting with the first call to prayer at dawn. Then, as its residents go about their daily activities, traffic quickly becomes intense. Cars and trucks whiz through the wider ways, while intense swarms of motor scooters, bicycles, donkey carts compete with pedestrians for the right of way on tighter streets. Djemaa el Fna bustles with all sorts of commerce, along with continuous entertainment, acrobats, storytellers, musicians and snake charmers. At night, its food stalls fire up, offering exotic treats that range from snail soup to spicy barbecued meats. Unlike so many other places in the world that somehow look the same and familiar, the medina remains distinct and authentic. One measure of this is that while the urban sprawl of modern Marrakech now houses more than a million people, the medina's entire 5 square miles has been designated a World Heritage Site, defined by the United Nations as a place of importance to the common heritage of humanity to be preserved for the ages. As my wife Sari and I discovered during a four-day visit last November, the medina of Marrakech can also be a uniquely accommodating place. The riad is a typical design for Moroccan houses or palaces. Generally two- or three-story structures, they are built around a central courtyard, with all rooms opening to the interior. Windowless walls facing the narrow, featureless streets conceal private paradises within. The riads provided the well-to-do with refuge from the clamor of the street and protection from summer's heat and winter's cold. In lieu of hanging art, the interior walls of riads were adorned with elaborately carved plaster and tiled mosaics of intricate designs. Other hallmarks include the mashrabiyya, the wooden or metal latticework over the balcony and window screens. Combined with rich fabrics, piles of cushions and a fountain in the central courtyard flanked with small orange or lemon trees, riads were places of natural repose. The noble and wealthy of Marrakech constructed dozens of riads in the medina over the centuries, ranging from palatial to pedestrian. Recent decades have seen renewed appreciation of these traditional structures. Crumbling riads have been purchased and restored, some as private residences, but more often as a small inn or restaurant. Greater Marrakech has numerous modern hotels, which offer the amenities discriminating travelers have come to expect. More rare, however, are those opportunities to experience authentically exotic accommodations of another era. That is the promise of staying in a riad. We happened upon Riad Si Said, one of the properties in the Angsana Collection, a recent venture funded by Banyan Tree, the Singapore-based, premium resort and hotel company. The riad was constructed in the 1880s as the seraglio for the brother of the prime minister of the Kingdom of Marrakech, where he housed his harem. 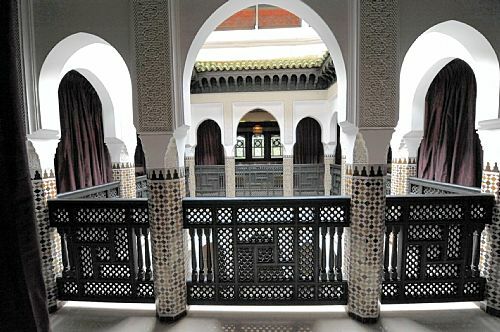 It is one of six once grand riads Angsana has renovated on quiet back streets in the medina. Each has six or eight guest rooms and features five-star amenities, with an asterisk. That asterisk comes because while these riads reflect all the Moroccan beauty and grace of their original decors, and they are carefully serviced, there are also idiosyncratic elements inherent in staying in 130-year-old buildings in a neighborhood that itself is more than 1,000 years old. It is wonderful to lounge on a pasha's rooftop terrace and hear the evening call to prayer, with a faint incense of cedar smoke wafting in the air. On the other hand, negotiating a narrow stone stairway and rooms that all open to the interior provide for a different type of intimacy among guests, while intermittent lapses of water and electricity are always part of life in the medina. Another Marrakech hostelry we enjoyed, is less a traditional riad than an elegant inn.Situated on its own side street, La Maison Arabe has achieved significant status since it opened in 1946 as the first Marrakech restaurant to serve foreigners, attracting a clientele that included Winston Churchill, Charles de Gaulle and Jackie Kennedy. In 1995, Fabrizio Ruspoli, a descendent of Roman nobility who was blessed with boundless charm and taste, purchased the restaurant and an adjacent riad. He spent three years transforming it into Marrakech's first boutique hotel, with 13 rooms and suites. A more recent acquisition allowed the expansion to 26 guest rooms, most with private terraces and fireplaces overlooking the central pool. In addition, there are three restaurants, a piano bar, a cooking school, as well as a new spa including traditional hammam baths, where only natural products from the region are used. Its flower-filled patios and abundance of traditional Moroccan craftsmanship (tadelakt walls, chiseled plaster, cedar wood ceilings), give La Maison a refined and exotic atmosphere. While we didn't spend the night there, we thoroughly enjoyed the cooking class offered at La Maison, where we learned the intricacies of preparing chicken tangine and carrot soup. Another evening, the dinner we had at La Maison was among the most memorable I've ever had. 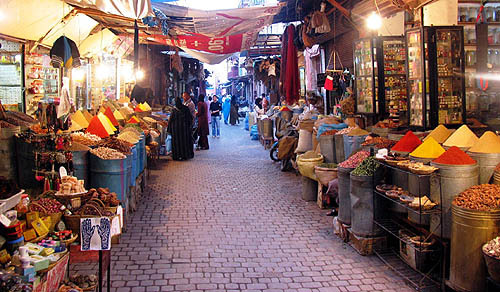 Marrakech's medina also offers luxury on a palatial scale, if that suits your taste and travel budget. The poshest place to stay inside the medina walls is La Mamounia. Erected in 1923 on the 15-acre garden of Prince Mamoun, a scion of an 18th-century sultan, this grand hotel has hosted the rich and famous, from Charlie Chaplin and Omar Sharif to more modern muses such as Mick Jagger, Kate Winslet and Nicole Kidman. La Mamounia was the Marrakech hotel where James Stewart and Doris Day stayed in Alfred Hitchcock's mystery "The Man Who Knew Too Much." Reopened last September after a three-year, $176 million makeover by the Parisian designer Jacques Garcia, it is again resplendent, with 136 guest rooms, 71 suites and three riads -- each with private terrace, swimming pool and Moroccan-themed rooms. Its four restaurants serve a mixed fare of classic French, modern Italian and Moroccan cuisine, but we enjoyed an excellent buffet luncheon at the side of a vast swimming pool that was the epitome of understated elegance. The sparkling new spa executed in traditional tiles, sculpted plaster and carved woods complements the hotel's traditional rooms, such as Churchill's Bar, where the great man himself used to sit, smoke cigars and listen to jazz. It is indeed a palace of pleasure, an oasis of green both removed entirely from the hurly-burly of the medina outside, yet just two blocks from all the action. • Djemaa El-Fna is the main attraction of any Marrakech night. Musicians, dancers, acrobats and storytellers fill this square at the heart of the medina with a chaos of activity, noise, sights, smells and tastes. Scores of stalls sell an array of Moroccan fare. Enjoy the various performers, but be prepared to pay to watch. By day the square is largely filled with snake charmers and people with (ill-treated) monkeys as well as the more common stalls. • Koutoubia mosque, next to Djemaa El-Fna, is named after the booksellers market once located here. Although non-believers are not permitted to enter the mosque, it is the prime place for prayers five times each day and beautifully lit at night. The minaret of the Koutoubia mosque in Marrakesh, Morocco. • The souks (suuqs) or markets of Marrakech along the streets that lead to and around Djemaa El-Fna, are where you can buy anything from spices to shoes, tagine pots, djellabas (robelike garment with hood), kaftans, Moroccan carpets and basketry. Be sure to bargain. If you happen to run out of dirhams -- the Moroccan currency -- plenty of people in the souks will be happy to exchange your dollars or euros, though probably for less than the official exchange rate of 7.1 to the dollar. Don't expect to pay with a credit card, even at sit-down restaurants, and sometimes even large denomination dirham bills can be hard to use at the smaller stands. • The Saadian Tombs were discovered only a century ago, preserved just as they were during the glory days of the Saadian rulers. Decorated inside with Zelij (Moroccan tiles), they don't take a lot of time to explore, but are worth a visit. Also look for the tombs of Jews and Christians buried here, which are noted by different letterings and the direction the tomb faces. • The Majorelle Gardens are situated just outside the medina. The entrance fee of 30 dirhams per adult is more expensive than Marrakech's other attractions, but in addition to providing excellent escape from the heat, the gardens boast an impressive collection of plants from across the globe. Once part of the estate of the French designer Yves Saint Laurent and his partner Pierre Bergere, the gardens also include a small Museum of Islamic Art, which requires an additional entrance fee. • The Dar Si Saïd Museum is set in an old palace five minutes away from Djemaa El-Fna (and just next door to riad si Said, where we stayed.) It houses an eclectic assortment of artifacts from Morocco through the ages, woodcraft, carpets, clothing, pottery and ceramics. • Ben Youssef Madrassa, one of the largest educational institutions in North Africa, is a school attached to the Ben Youssef Mosque and is home to beautiful art and architecture. • Built in the late 19th century, El Bahia Palace is an ornate and beautiful complex, popular with guided tours and stray cats. Although entirely stripped of its furnishings, its ornately tiled rooms provide some insight of what it must have been like to be a nobleman in Morocco. Admission is 10 dirhams. The El Badi Palace is now in ruins and inhabited by storks and stray cats, although the view from the terrace is spectacular. There are underground passageways to explore. Admission is 10 dirhams.